This adventure came about completely by accident. 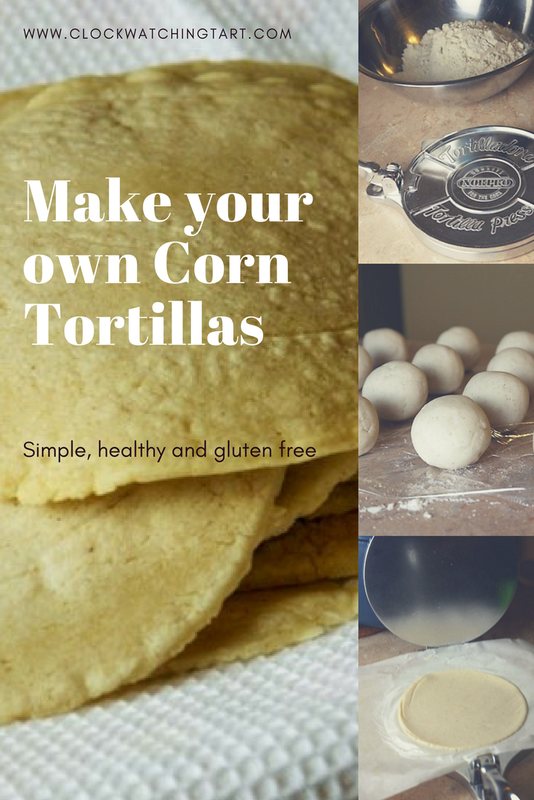 I had a meal planned that called for corn tortillas and I was planning to pick them up at the grocery store, but after trying two different stores, corn tortillas were nowhere to be found. I did find instant masa though, and figured I could make my own tortillas. I ordered a tortilla press online and got to work! This mix is very easy, all you have to do is add water and a little salt. I just followed the instructions on the package. I added 1.5 cups of water to 2 cups of mix and sprinkled in 1/4 teaspoon of salt. Then mixed it for 2 minutes until the dough formed. and rolled it into balls. This amount of dough makes 16 balls/tortillas. Place a damp towel over the dough balls so they don't dry out. Now, there was a little trial and error on our first few tortilla attempts. First we tried lining the tortilla press with plastic wrap as suggested on the masa package, but it didn't work out so well. The tortilla flattened, but it wouldn't come off the plastic wrap in one piece. Next we tried parchment paper sprayed with a little cooking spray and that, eventually worked much better. The tortilla press simply flattens the dough into an even disc. Then you cook the tortilla in a non-stick pan for about 1 minute per side and they're done! Wrap them in a dish towel to keep them warm while you press and cook the rest. Once we got the hang of this it was easy and the results were delicious! No need to worry about finding tortillas in the grocery store any more!